A motherboard (sometimes alternatively known as the main circuit board, system board, baseboard, planar board or logic board, or colloquially, a mobo) is the main printed circuit board (PCB) found in general purpose computers and other expandable systems. It holds and allows communication between many of the crucial electronic components of a system, such as the central processing unit (CPU) and memory, and provides connectors for other peripherals. Unlike a backplane, a motherboard usually contains significant sub-systems such as the central processor, the chipset's input/output and memory controllers, interface connectors, and other components integrated for general purpose use and applications. Similarly, the term mainboard is applied to devices with a single board and no additional expansions or capability, such as controlling boards in laser printers, televisions, washing machines, mobile phones and other embedded systems with limited expansion abilities. Prior to the invention of the microprocessor, the digital computer consisted of multiple printed circuit boards in a card-cage case with components connected by a backplane, a set of interconnected sockets. In very old designs, copper wires were the discrete connections between card connector pins, but printed circuit boards soon became the standard practice. The Central Processing Unit (CPU), memory, and peripherals were housed on individual printed circuit boards, which were plugged into the backplane. 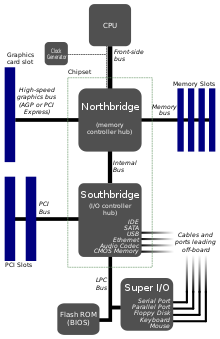 The ubiquitous S-100 bus of the 1970s is an example of this type of backplane system. During the late 1980s and early 1990s, it became economical to move an increasing number of peripheral functions onto the motherboard. In the late 1980s, personal computer motherboards began to include single ICs (also called Super I/O chips) capable of supporting a set of low-speed peripherals: keyboard, mouse, floppy disk drive, serial ports, and parallel ports. By the late 1990s, many personal computer motherboards included consumer-grade embedded audio, video, storage, and networking functions without the need for any expansion cards at all; higher-end systems for 3D gaming and computer graphics typically retained only the graphics card as a separate component. Business PCs, workstations, and servers were more likely to need expansion cards, either for more robust functions, or for higher speeds; those systems often had fewer embedded components. Power connectors, which receive electrical power from the computer power supply and distribute it to the CPU, chipset, main memory, and expansion cards. As of 2007[update], some graphics cards (e.g. GeForce 8 and Radeon R600) require more power than the motherboard can provide, and thus dedicated connectors have been introduced to attach them directly to the power supply. Motherboards are produced in a variety of sizes and shape called computer form factor, some of which are specific to individual computer manufacturers. However, the motherboards used in IBM-compatible systems are designed to fit various case sizes. As of 2007[update], most desktop computer motherboards use the ATX standard form factor — even those found in Macintosh and Sun computers, which have not been built from commodity components. A case's motherboard and power supply unit (PSU) form factor must all match, though some smaller form factor motherboards of the same family will fit larger cases. For example, an ATX case will usually accommodate a microATX motherboard. Laptop computers generally use highly integrated, miniaturized and customized motherboards. This is one of the reasons that laptop computers are difficult to upgrade and expensive to repair. Often the failure of one laptop component requires the replacement of the entire motherboard, which is usually more expensive than a desktop motherboard due to a large number of integrated components and their custom shape and size. The motherboard layout for laptops depends on the laptop case. Motherboards are generally air cooled with heat sinks often mounted on larger chips, such as the Northbridge, in modern motherboards. Insufficient or improper cooling can cause damage to the internal components of the computer, or cause it to crash. Passive cooling, or a single fan mounted on the power supply, was sufficient for many desktop computer CPU's until the late 1990s; since then, most have required CPU fans mounted on their heat sinks, due to rising clock speeds and power consumption. Most motherboards have connectors for additional computer fans and integrated temperature sensors to detect motherboard and CPU temperatures and controllable fan connectors which the BIOS or operating system can use to regulate fan speed. Alternatively computers can use a water cooling system instead of many fans. Some small form factor computers and home theater PCs designed for quiet and energy-efficient operation boast fan-less designs. This typically requires the use of a low-power CPU, as well as a careful layout of the motherboard and other components to allow for heat sink placement. Mid-range and high-end motherboards, on the other hand, use solid capacitors exclusively. For every 10 °C less, their average lifespan is multiplied approximately by three, resulting in a 6-times higher lifetime expectancy at 65 °C (149 °F). These capacitors may be rated for 5000, 10000 or 12000 hours of operation at 105 °C (221 °F), extending the projected lifetime in comparison with standard solid capacitors. Motherboards contain some non-volatile memory to initialize the system and load some startup software, usually an operating system, from some external peripheral device. Microcomputers such as the Apple II and IBM PC used ROM chips mounted in sockets on the motherboard. At power-up, the central processor would load its program counter with the address of the boot ROM and start executing instructions from the ROM. These instructions initialized and tested the system hardware displayed system information on the screen, performed RAM checks, and then loaded an initial program from a peripheral device. If none was available, then the computer would perform tasks from other memory stores or display an error message, depending on the model and design of the computer and the ROM version. For example, both the Apple II and the original IBM PC had Microsoft Cassette BASIC in ROM and would start that if no program could be loaded from disk. On recent motherboards, the BIOS may also patch the central processor microcode if the BIOS detects that the installed CPU is one for which errata have been published. Many motherboards now use an update to BIOS called UEFI. ^ Miller, Paul (2006-07-08). "Apple sneaks new logic board into whining MacBook Pros". Engadget. Archived from the original on 2013-10-04. Retrieved 2013-10-02. ^ "Golden Oldies: 1993 mainboards". Archived from the original on 2007-05-13. Retrieved 2007-06-27. ^ "CPU Socket Types Explained: From Socket 5 To BGA [MakeUseOf Explains]". 2013-01-25. Archived from the original on 2015-04-07. Retrieved 2015-04-12. ^ W1zzard (2005-04-06). "Pinout of the PCI-Express Power Connector". techPowerUp. Archived from the original on 2013-10-04. Retrieved 2013-10-02. ^ Karbo, Michael. "The CPU and the motherboard". Karbos Guide. Archived from the original on 27 April 2015. Retrieved 21 June 2015. ^ "Temperatures". Intel® Visual BIOS Wiki. Google. Archived from the original on 21 June 2015. Retrieved 21 June 2015. ^ c't Magazine, vol. 21, pp. 216-221. 2003. ^ Chiu, Yu-Tzu; Moore, Samuel K. (2003-01-31). "Faults & Failures: Leaking Capacitors Muck up Motherboards". IEEE Spectrum. Archived from the original on 2003-02-19. Retrieved 2013-10-02. ^ "Capacitor lifetime formula". Low-esr.com. Archived from the original on 2013-09-15. Retrieved 2013-10-02. ^ "-- GIGABYTE --Geeks Column of the Week - All Solid Capacitor". www.gigabyte.com. Archived from the original on 2017-03-27. Retrieved 2017-05-06.